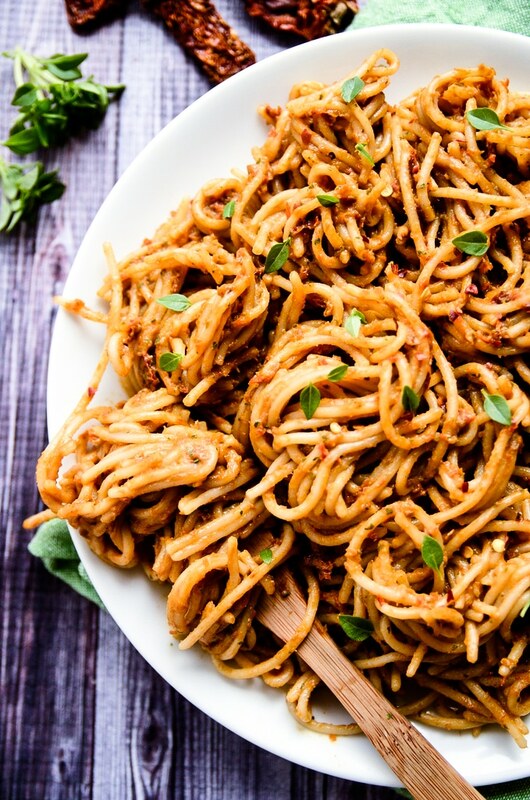 This creamy sundried tomato & avocado pesto pasta is creamy, zesty, and packed with flavor. 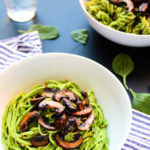 The pesto is made by blending together avocado, sundried tomatoes, basil, lemon juice, garlic, salt, and red pepper flakes until smooth and creamy. Spoon the pesto over hot pasta, toss to coat, and serve. That’s it. 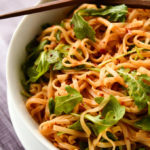 This is one of those basic meals that you can make again and again when in a time crunch or craving a comforting, fresh, and summery pasta dish. In just a little over a week, I’ll be embarking on a Colorado vacation with a group of vacationers that hasn’t been brought together since November of 1999. Crazy? Yes. Especially considering that this group of people is family. Although I’ve mentioned things here and there about the logistics of my life, I don’t think I’ve ever fully explained that I have two immediate families. 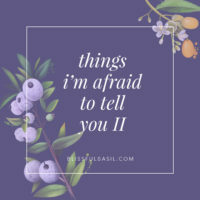 Despite nearly four years of blogging, I’m still slowly peeling back the layers of my life onion, and I hope you don’t mind my sharing because it’s both scary and relieving to be slightly vulnerable. 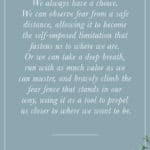 If you have a few extra moments, read on. If not, scroll on down to the last paragraph before the photos for some tasty adjectives about this pasta. Way back when I was 8 and my brother, Brad, was 6, our mom and dad decided to part ways. No sap stories here, hindsight is 20/20 and this decision was for the best. Brad and I spent the majority of time with our mom and weekends with our dad, and not too far down the road each of them met someone new. After a few years, those new people become permanent fixtures in our lives as stepmom and stepdad. However, there will be no prefixing their titles with the word “evil” because these two are the farthest thing from the stereotype. They are my reason for viewing my parents’ divorce in a completely positive light, and my life wouldn’t be complete without them. My dad and stepmom also decided to have two little ones, so our family of two kids doubled to four. Technically, I have a brother, a half brother, and a half sister, but actually, I have two brothers and a sister. Half schmalf. My younger brother and sister live with my dad and step mom and are 10 and 11 years my juniors, so it’s been incredible to witness their progression from infancy to young adulthood. They, too, make life more complete. Each of us is grateful that our parents get along with one another, which we know is a rare and precious thing. I had a father on each arm walking me down the aisle at our wedding, we’ve spent the last 12+ Christmas Eves together as one, big, happy family, and we even come together on holidays like Father’s Day. There’s no denying that there were potholes in the road early on in the journey, but we’ve reached a special destination as a family. A place where we can come together, differences aside, and create happy memories. Although Brad and I have been on more recent family trips with our mom and stepdad pops, the last time we vacationed with my dad, stepmom, little brother, and little sister was nearly 15 years ago. I had braces and a wardrobe made up of 40% American Eagle, 55% Abercrombie & Fitch, and 5% teenage awkwardness. It was a lonnnnnnng time ago. After 15 years, we finally decided to get the travel crew back together for a 10-day trip to Colorado (significant others included, too), and we’ll be heading to Steamboat Springs for some outdoorsy adventure time. I’m really looking forward to the trip and will be sure to include vacation stories in posts that week. I know that life story has nothing to do with this pasta, but I’ve been planning for the trip and realized that talking about it on the blog warranted a bit of background information. So now, this pasta. Dan and I are only a few weeks into our urban garden growing, and we already have enough basil to make pesto for days. I think the only thing I have a green thumb for is basil, which is both coincidental and slightly embarrassing. I’m not terrible with other plants, but basil seems to grow like weeds from our 4th-floor window boxes. This year, we have a city-friendly varietal called “Windowbox” Basil, and it’s the cutest thing I’ve ever seen. It looks like tiny boxwood bushes and has the most incredible flavor. We also have two Italian Sweet Basil plants that are perfect for making pesto, so I’ve been making plenty of this to keep the plants from flowering. 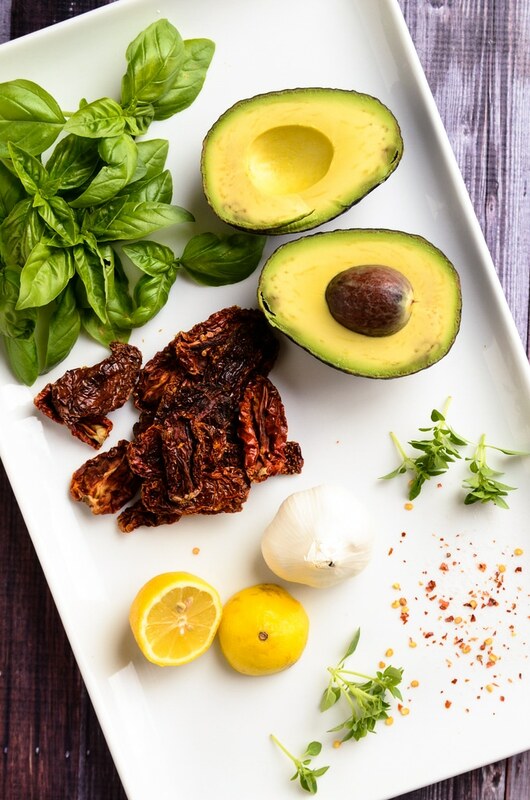 The only ingredients in this pesto recipe are avocado, sundried tomatoes, basil, lemon juice, garlic, salt, and red pepper flakes, and they blend together in just a few minutes in a food processor. 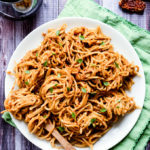 I served this creamy sauce over brown rice spaghetti, but any type of pasta would be wonderful. This is one of those basic meals that you can make again and again when in a time crunch or craving a comforting, fresh, and summery pasta dish. I love that the creaminess of the sauce comes from fresh avocado, and the sundried tomatoes add a touch of sweetness and a lovely pop of red. 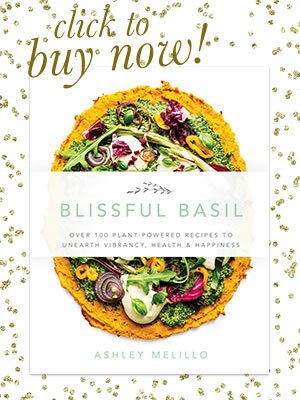 This is the perfect way to put your garden basil to use when your go-to homemade pesto recipe is feeling a bit stale. 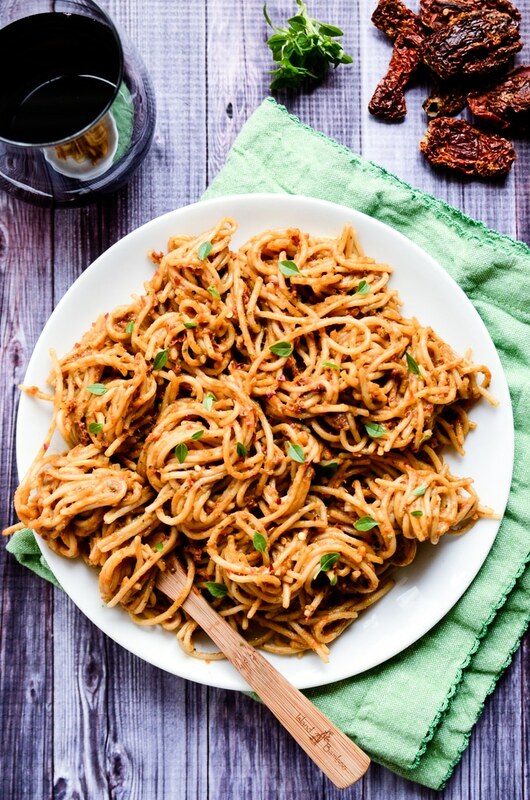 This creamy sundried tomato & avocado pesto pasta is creamy, zesty, and packed with flavor. 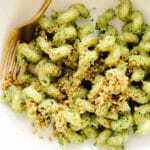 The pesto is made by blending together avocado, sundried tomatoes, basil, lemon juice, garlic, salt, and red pepper flakes until smooth and creamy. Spoon the pesto over hot pasta, toss to coat, and serve. That's it. This is one of those basic meals that you can make again and again when in a time crunch or craving a comforting, fresh, and summery pasta dish. Begin by soaking the sundried tomatoes in warm water for 10-15 minutes to soften. Drain and set aside. Add the avocado, sundried tomatoes, basil, garlic, lemon juice, sea salt, and red pepper to a food processor. Process for 2-3 minutes or until smooth. 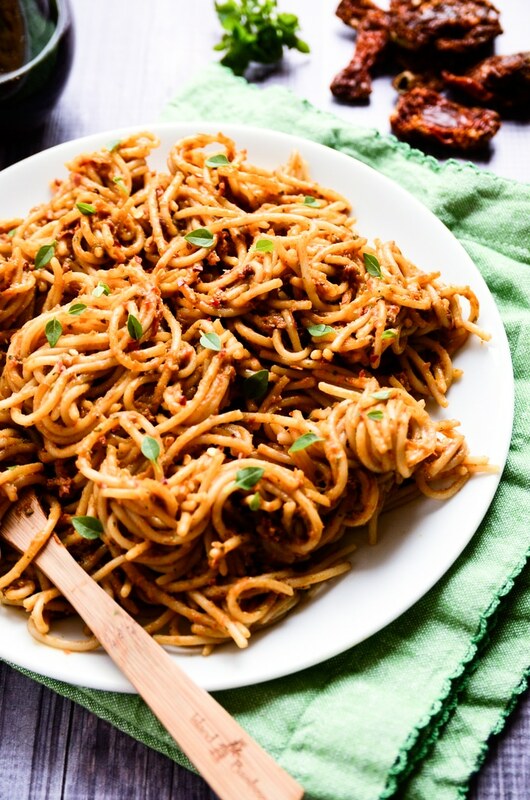 Add your cooked spaghetti noodles to a large bowl, pour the sauce over the noodles, and toss to coat. 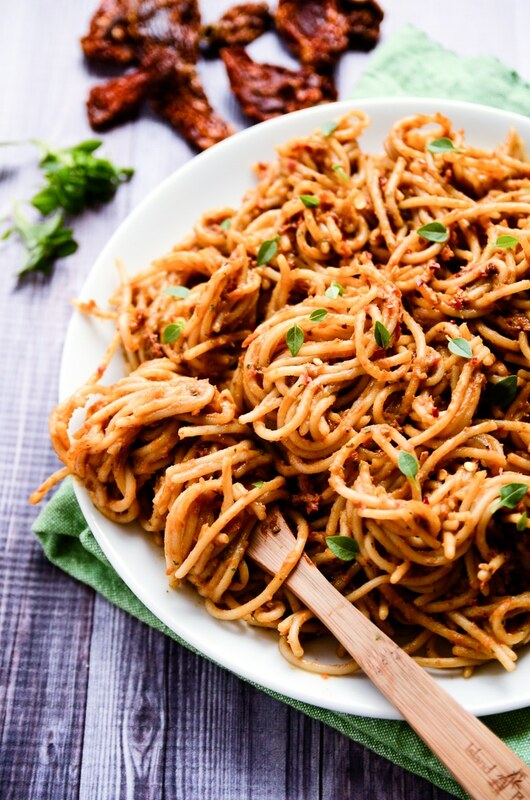 If your noodles are sticking, add in some of the pasta water 1 tablespoon at a time. Taste and season with more sea salt, if desired. Divide your pasta amongst 3-4 plates, add garnishes, and serve. Wow this looks amazing. I’ve never heard of avocado pesto and being and avocado fanatic this just made my day! Thanks, Matt! 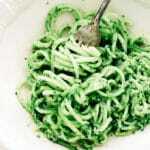 It works wonders in this pesto, and I’m sure it would also be great in a more classic take on pesto. I hope you have a chance to enjoy the recipe! I didn’t have avocados, and used oil packed sun-dried tomatoes, which worked great! Will try your exact recipe soon! I also added it to Pinterest. It seems quite popular! I just made this with fresh tomatoes since we didn’t have dried ones, even my mother loved it. Hi Barb! I’m so glad that it worked out just as well with fresh tomatoes; I’ll have to try that substitution with the tomatoes from our garden! Also happy to hear that your mother loved it :) Thanks for commenting with adjustments and compliments! Is this recipe freezer friendly?? Hi Andrea! Unfortunately, it’s not because of the avocado. Definitely best enjoyed fresh! I read recently that avocado can be frozen – peel and mash, add juice of 1 lemon per avocado. I have not tried it myself yet. 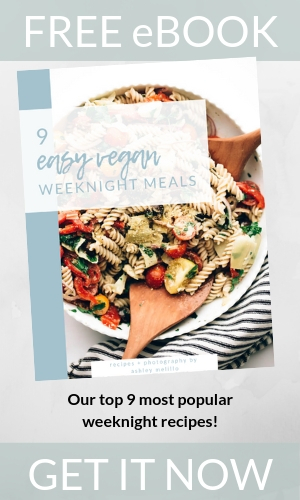 I made this tonight for dinner and it’s so delicious! I soaked the sun dried tomatoes while running errands and when I came home I was surprised that it literally took me only 15 minutes to prepare. 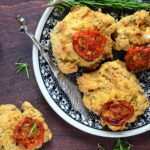 This will definitely become a staple recipe in my house, thanks so much! I’m happy to hear you found it to be so quick and easy to prepare, Mandi. Great idea to soak the sun dried tomatoes while you ran errands. Thanks for taking the time to comment with your feedback! 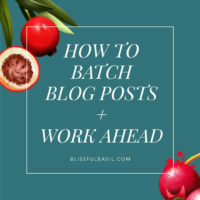 Love this recipe as it is so versatile. Added a chilli as I like a bit of heat. Served it with Tuna steak and asparagus and yellow pepper strips. Awesome. Many thanks. This looks super yummy! But I have a question. If you have sundries tomatis packed in oil, do you still need to soak them? Okay I just made this recipe and it was absolutely amazing! Oh my goodness I think I found my new favorite dish! Thank you so much for this recipe! Thanks, Paula! I’m glad the recipe and especially the story struck a chord with you. It’s definitely a special family dynamic and one that took about a decade to come to be (after a handful of rough, not so fun interactions). I can’t imagine how much different (and stressful) life would be had my parents not put their differences aside enough to remember the little things that brought them together in the first place. This is a great recipe! My husband loves it and asks for it every week. Is it possible to double the recipe? The problem when I do this sometimes the taste changes because some ingredients shouldn’t be doubled. What’s the case with this recipe? Hi, Salam! Thank you for sharing your feedback — I’m so, so glad you and your husband are enjoying it so much! As for doubling the recipe, I wouldn’t do it with this one unless you’re cooking it for a large group, and it will all be consumed within the first day of making it. Because the sauce contains avocado and avocado browns so quickly, it’s not a dish that keeps well in the refrigerator for extended periods of time. I hope this helps! Made this the other night! 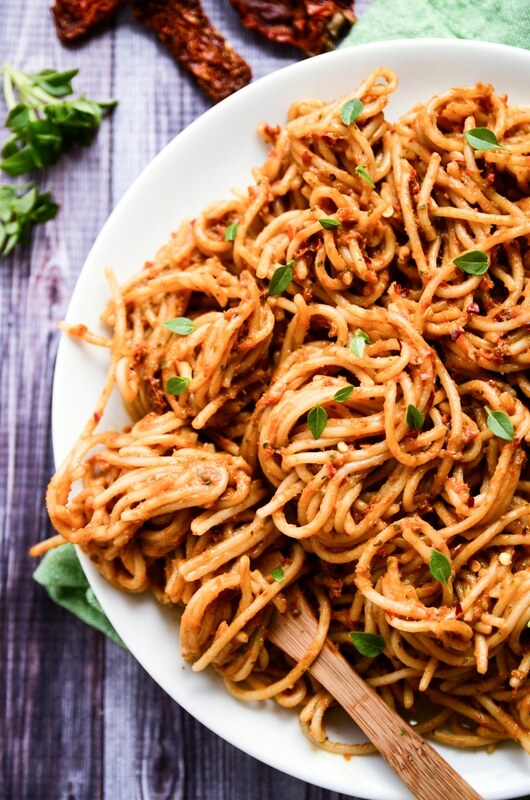 The Sundried Tomato Avocado Pesto is to die for!! My pesto turned out pretty thick so I served it in large dollops on top of spaghetti nests instead of trying to stir them together. It was SOOOO delicious! This is really good as its own dip too! We had some with french fries… I mean veggies… too :-) MMMMMMMmmmmmm! Love Love Love! Glad you’re enjoying the pesto, Brynna! Great idea to use it as a dip for fries and maybe some veggies too. :) Sounds amazing. i made this tonight for a quick dish, no pasta though! I paired it up with homemade soup and put it on crispy bread like a bruchetta! it was delicious! Sounds great! I was wondering though, how many Zucchinis would you use if you were going to make Zoodles instead? Thanks, Rachel! Honestly, I just eyeball it when I’m making zoodles. 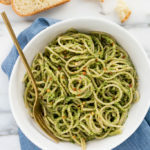 Zucchini vary GREATLY in size (especially this time of year), so spiralize enough to serve however many you’re serving and then add the pesto to taste. Enjoy! I made this for dinner last night and it was delicious. My husband snarfled it up like he hadn’t eaten in weeks! LOL! Thank you. This one’s a keeper! I want to try this out tomorrow. Do you recommend other veggies or protein to add to the recipe? Like beans? Or Lentils? Or chicken? I love this one just as is but you could certainly add to it. I don’t eat meat so can’t comment there but I could see lentils potentially working if sprinkled on top for a little protein boost. Enjoy!